Tasting different types of java on a coffee-mill tour. (FSB) -- I didn't plan to go to the Hilo Coffee Mill. 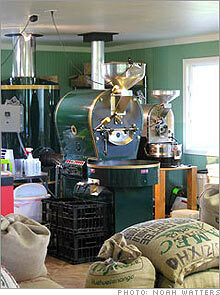 In fact, on my tour of Big Island farms, I intend to skip coffee entirely. Not that there was any shortage of Kona coffee tourist experiences - they are some of the only agritourism operations with the marketing sophistication to, say, leave brochures in hotel lobbies - but I was looking for the more unusual crops. But it was a gray morning on my drive from Tea Hawaii in the town of Volcano to Wailea Agricultural Group in Wailea, just north of Hilo, and my boyfriend and I were ahead of schedule. A cup of coffee sounded nice, so we pulled into the parking lot of Hilo Coffee Mill in Mountain View with a pact: We wouldn't stay long. At the Hilo Coffee Mill, sacks of beans await the roaster. Plunked onto a verdant 24-acre property, the company's store struck me as rather plain: Inside were just some shelves with bags of coffee, a few employees working at desks in the back. As my boyfriend and I began to browse the copper-colored coffee bags with a squinty unfamiliarity, a well-caffeinated employee rushed up and asked whether we would like a coffee tasting. "Ah... really we'd just like coffee to go," I said, reluctant to be roped into a sales pitch. "Sure!" she replied, bringing us over to a minimalist coffee counter. "Would you like our Ka'u medium roast, our Hamakua Full City Roast, or our pineapple cheesecake flavored coffee?" she asked. We stared blankly and gave in to the tasting experience as little paper cups appeared before us. That's where the reluctance ended. To me, coffee is either "good" or "not good" - I don't have the credentials to be a snob about it - but I can attest that Hilo Coffee Mill's java ranks high up in the "good" category. Mill co-owner Jeanette Baysa, 52, sidled up to us as we chose the Hamakua Full City Roast (and bought a pound of the beans to go). Baysa felt like an old friend as she offered us a tour of the mill. "How often do you give tours?" I asked. "Whenever people ask! We love giving tours," she replied. Turns out tours are also free. Sold. Baysa led us to an identical building next door where the coffee roaster was warming up and explained the business. Hilo Coffee Mill's specialty is Hawaiian-grown coffee from all over the Big Island; Kona, yes, but it revels in showcasing coffee from lesser-known regions such as Puna, Ka'u, and Hamakua. Baysa and co-owner Kathy Patton, 59, formerly owned an espresso cafe in the town of Hilo, but were annoyed by the variation in coffee quality they would receive from vendors. Feeling they could produce a better product, they opened Hilo Coffee Mill in 2001 and sold the café in 2004 to focus on the beans. Hawaiian Coffee is almost always associated with Kona, which is on the western side of the Big Island, but the eastern part of the island has a coffee history as well. In 1898, there were 6,000 acres of coffee growing here. But as the century turned, coffee prices plummeted and sugar-cane plantations took over. Today, sugar cane is largely gone from Hawaii, so Baysa and Patton are hoping to bring coffee back to their side of the island, both by buying coffee cherry from 25 to 30 local farmers and processing it into drinkable coffee on behalf of 70 other small scale growers. Their roaster does small batches, only 30 pounds at a time, and Baysa often consults with local chefs to create custom blends that match their menu. Interestingly, the Mill doesn't do much decaf. The closest decaffeination plant using a natural water method is in Canada. Baysa and Patton do buy decaf Kona and Kauai beans from other firms, but everything else processed on-site is fully charged. Despite a drizzle, we walked out to survey the open farmland on the property. When Baysa and Patton bought the property, it was so full of dense sugar cane plants and weeds that it took two bulldozers four months of full-time work to clear it. In its place, Baysa and Patton have planted 6,000 coffee trees, which are currently two years old, just short of the three to five it takes for a tree to produce a viable crop. As soon as later this year, Hilo Coffee Mill will sell its own beans. As with most agritourism businesses, the Hilo Coffee Mill hopes that when visitors can see how the crop is grown and processed, they'll become repeat customers through internet and phone orders. I confess, now home in San Francisco, I've been tempted back. I even ordered a pound of pineapple cheesecake coffee.